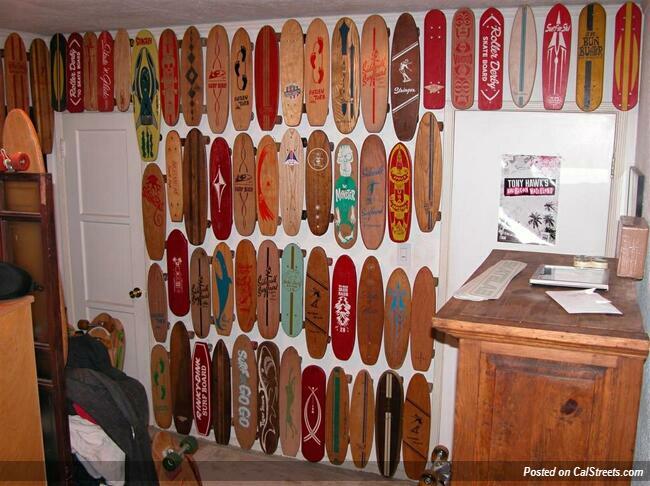 “One thing about skateboard collectors,” he cautioned, “even t hough they understand what a rare board is and what a collectible board is and the importance of condition, their holy grail is that board they owned themselves as a kid, whether that’s a production board that’s easy to find or a one of a kind.” When asked, Vuckovich readily admitted to reacquiring his old board. The dawn of skateboarding came about in the very late 1950s and early 1960s as an outgrowth of surfing, which means there are baby boomers in their fifties who remember riding old wooden “sidewalk surfers” with metal or clay wheels. Peralta’s award-winning Dogtown and Z-Boys documentary has precious film footage from these early days. The most interesting clip may be one of young Dave and Steve Hilton, super skaters of the Sixties and, yes, Paris’s uncles. The focus of the Dogtown film, however, the second big wave of skateboarding popularity in the late 1970s which was made possible by the introduction of smooth-riding urethane wheels and a new kind of adjustable metal truck which is used to attach the wheels to the skateboard or deck. The maneuvers possible with these technical innovations gave rise to both vertical skating – which launches the skater up a ramp into the air – and street skating, the art of tricks involving street obstacles like railings and stairways. The ESPN X-Games televised Aug. 2-5 include skateboarding competitions in both specialties. Remember how much skateboarding Michael J. Fox does in the 1985 hit Back to the Future? 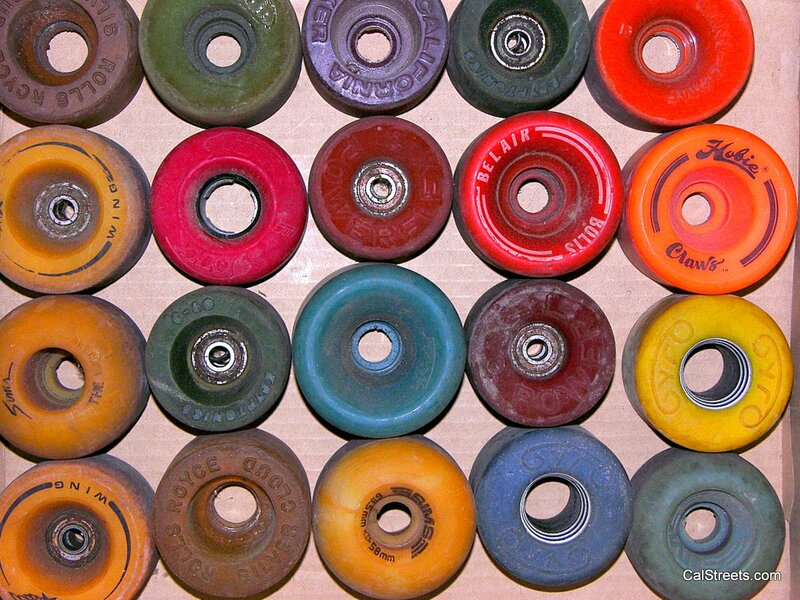 The big prices for vintage skateboards have been paid out not by baby boomers but by prosperous Gen-X collectors, looking back to their formative years in the 1980s. In addition to the technical innovations mentioned above, two media-related factors changed skateboarding from a coastally based fad to a nationwide action sport bristling with attitude. 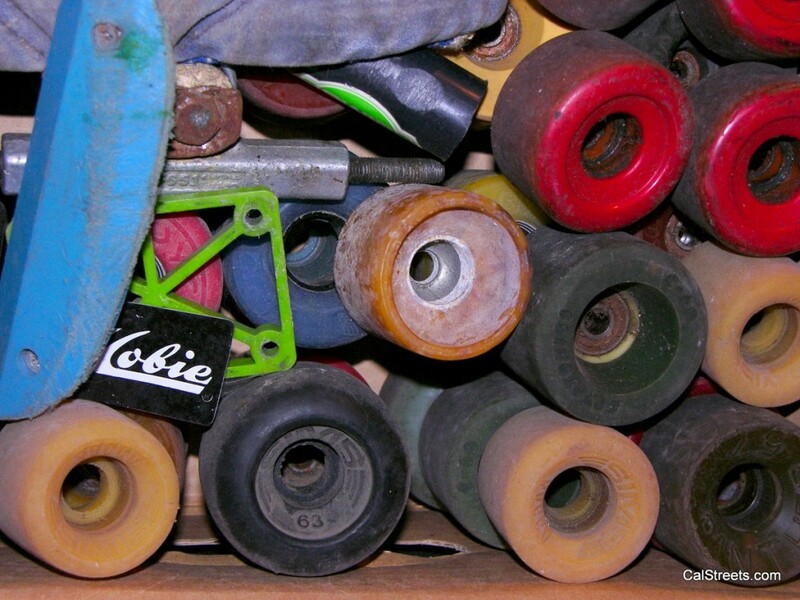 Specialist magazines like Skateboarder, Transworld Skateboarding, and Thrasher, made stars out of skaters and popularized their moves and favorite equipment, a practice that continues today. The second boost came from home video players, so kids could watch not only Back to the Future but pure skateboarding movies – put out by product manufacturers – over and over after school. After a successful pro career, the still-young Stacy Peralta joined forces in 1978 with engineer/designer George Powell to form the Powell-Peralta company. They not only made skateboards and T-shirts, they also produced videos starring the Bones Brigade, a company team of young skateboarders carefully selected and nurtured by Peralta. 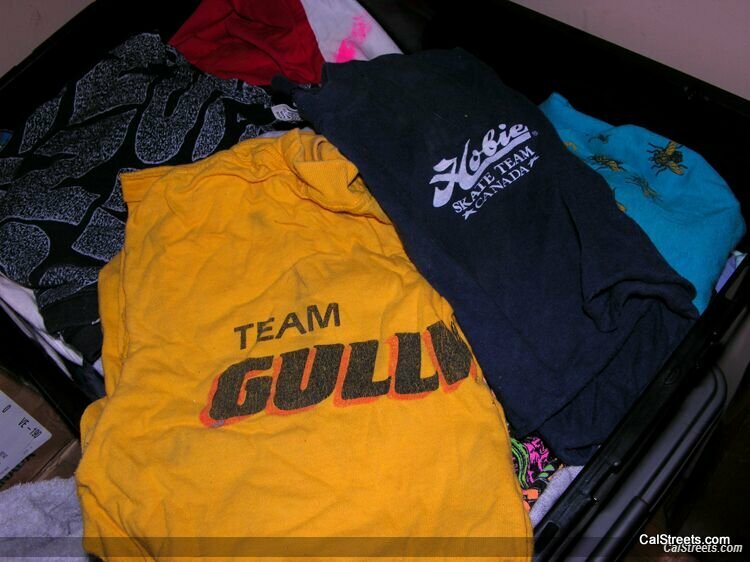 The best known member of the team was a gangly phenom named Tony Hawk, now one of the most recognizable athletes in America. 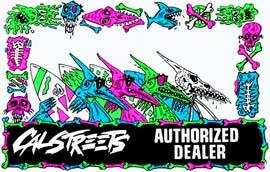 Each Bones Brigade team member had a distinctive skateboard design worked out with Powell artist Court Johnson, which also usually appeared as a T-shirt design. Skaters to the present day always pose with their decks art-side-out or execute tricks that allow the skateboard to be photographed from below. 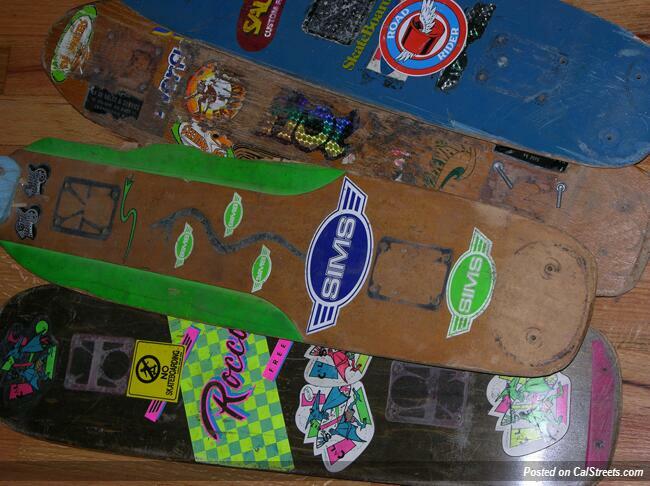 The punk-to-looney graphics of skateboards are what make them so attractive to nostalgic collectors. 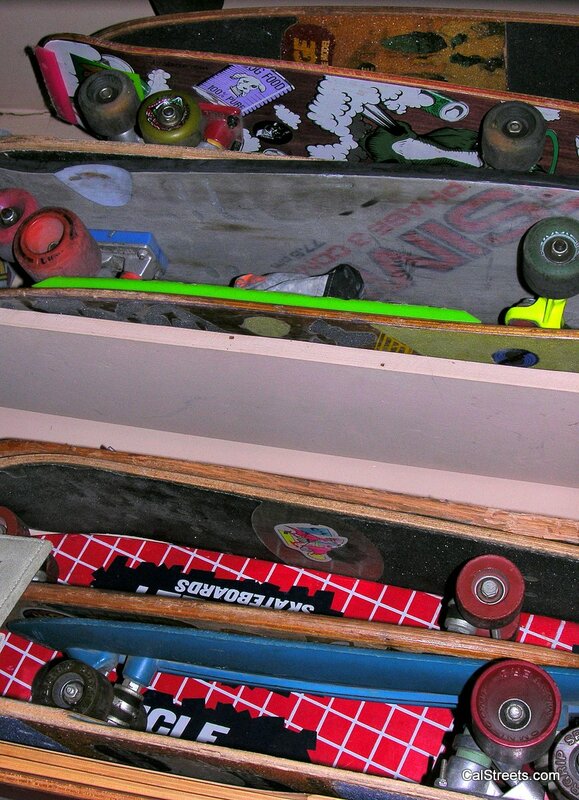 A quick search online will reveal hundreds of skateboards for sale from the 1980s, but before beginners try to navigate this minefield mixture of genuine models, reissues, and the outright suspicious, get some help from a seasoned collector.Chris Solomon, a k a Amorone, runs the website ArtOfSkateboarding.com which includes news, collector links, and great advice on how to value a skateboard. Animal Chin has recently been released in a special edition DVD with lots of extras, a lucky break if Mom threw out the videos. George Powell comments in the “making of” documentary, “It’s become almost a cult video … The whole industry was changing from being driven by advertising in magazines to being driven by videos.” The now-historic film records old- school skating style and provides a catalog of decks. Additional price information appears on the Solomon’s Web site every day, and he is careful to correct the misinformation about values that appears even in skateboarding publications. He says in his price guide, “As it has been said many times, an item is only worth what the market will bear. 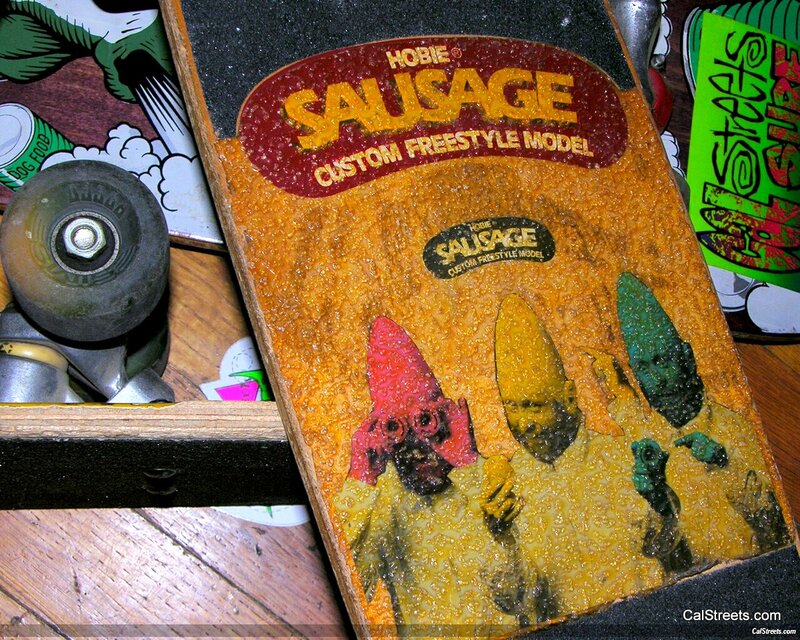 Someone might be holding on to a deck they think is worth thousands, but if it sells on eBay for $66, then that owner is a bit off the mark.” A record $6,000 was paid recently for Tony Hawk’s 1982 first pro model. Miki Vuckovich was a young skate mag photographer on the set of the video The Search for Animal Chin, and still gets to work with one of its stars, Tony Hawk, at the foundation the pro created to help young skaters. ”Through special events, grants, and technical assistance, the foundation supports recreational programs with a focus on the creation of public skateboard parks in low-income communities,” said Vuckovich.